This is our most popular all in one system. It features Protecta's AK105A tripod, AK200 Series AK206AG winch with 60' of galvanized cable, AK010A1 Pully with Carabiner and AK067A tripod bag. The winch is man-rated at 310lbs. and equipment-rated at 600lbs. The tripod is adjustable up to 8' and serves as a 5000lb anchor point. 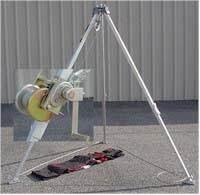 For more details on the winch and tripod, see their individual listings or download spec sheets. Note that if fall protection is required the purchase of a self retracting lifeline (SRL) or a rope grab kit will be necessary. They can be found in our Fall Protection category. Major Safety Service, 4500 Patent Rd., Norfolk, VA 23502. Tel: 757-855-2088; Fax: 757-855-8239.